Foxy is a perfect WordPress theme for building a business website. Its homepage features an eye-catching slider with unlimited color customization options. In this Foxy review, we’ll show its features and help you find out if it is the best theme for your business website. Elegant Themes Foxy is a WordPress theme that comes with every essential feature you need to bring your business online. 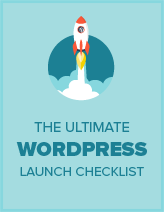 It is released by Elegant Themes, a premium popular WordPress themes and plugins hub. Its ePanel theme option lets you control your website without having to touch a single line of code. Additionally, you can use the theme customizer to customize colors, fonts, and other theme settings by looking at the theme preview. Let’s take a detailed look at its features below. 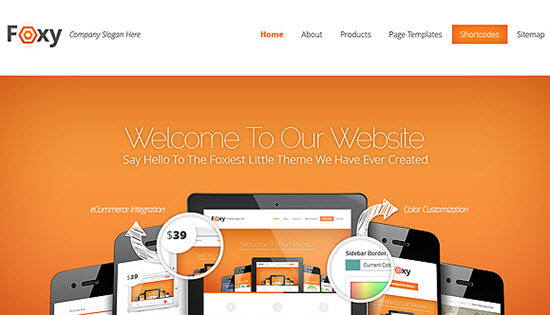 The main attraction of the homepage of Elegant Themes Foxy is its featured slider. The slider can be set up using 2 different methods. To set up, you’ll either need to populate the tabs using Pages or populate them using posts from a designated category. In your page editor, just below the text editor, you can find the ET Settings section, in which you can set options for the slider. 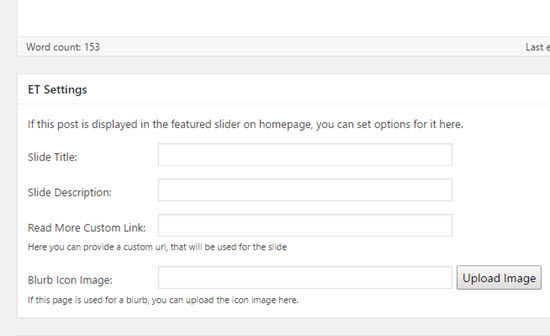 You can choose the featured posts’ category and the number of featured slides in the theme options by navigating to Appearance » Foxy Theme Options » General » Featured Slider. Customizing the homepage of a Foxy powered website is super easy. You can enable different content areas in the theme options. The homepage also features a call to action in a horizontal bar. In the demo site, it was placed between two content sections. In the theme options, you can customize its call out URL, text and button text by going to Appearance » Foxy Theme Options » General » Homepage. The theme supports a sidebar and three footer areas. It only supports a sidebar on the right-hand side. All the widget areas can be customized in the Widgets page. Elegant Themes Foxy gives you access to various built-in templates that come with pre-made styles and functions. 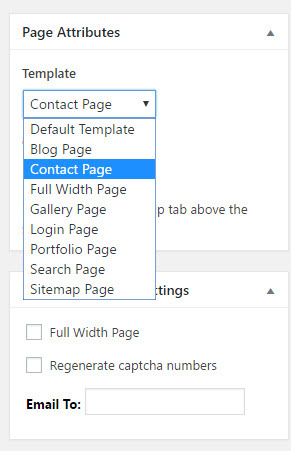 When a template is chosen, you can edit its corresponding options in ET Page Template Settings, just below the Page Attribute section. Upon installation of Foxy, an additional custom post type is created called Testimonial. The demo homepage features a testimonial in the homepage. In the testimonial page editor, you can find an option to add the company name just below the text editor. You can also add testimonials on other pages using a shortcode. One of the biggest benefits of using Foxy is it gives you the ability to customize the color palettes according to your choice. Beside background and main font colors, you can customize the colors of slider background, slider shadow, progress bar color, etc. You can customize the colors by navigating to Appearance » Customize » Colors. In case you do not want to use the custom color options, you can choose one of the built-in color schemes. This option comes handy if you’re not confident in your color sense. To customize the color schemes, you can go to Appearance » Customize » Schemes. Elegant Themes Foxy has extensive documentation that guides you on installing and configuring the theme. Useful screenshots and videos are also included in the doc, so you can easily skim through the content whenever you need assistance. To download Foxy, you’ll need to join the Elegant Themes club. Their plan starts from $89 per year. After joining, you’ll get complete access to all themes. To get lifetime access to all themes and plugins with lifetime premium support, lifetime updates and unlimited website usage, you’ll need to pay a one-time fee of $249. Support is offered through their official support forums. Elegant Themes are well-known for the quality and speed of their support. Elegant Themes Foxy is the best theme for your site if you’re looking for a WordPress theme that gives everything you need to bring your business online. If you can’t find any required functionality out of the box which you’d like to use on your site, chances are you can easily create them with shortcodes. With its large collections of shortcodes, you can improve the functionality of your content easily. For example, you can find shortcodes to add corporate pricing tables, custom icon lists, custom buttons and more. 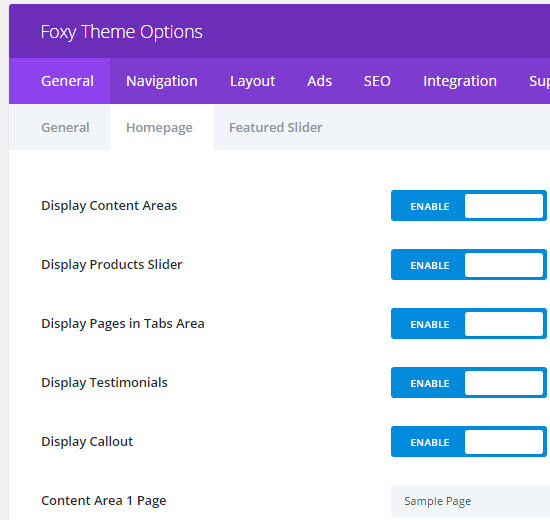 Plus, Elegant Themes Foxy supports different ad placements out of the box, so you can easily monetize your website with ads without any hassle. The theme is extremely easy to use even for beginners. We give Foxy 5 out of 5 stars. Here’s the breakdown of our scores.